Features Fixed, Two Column, Pink, Right Sidebar, Woman, Food. 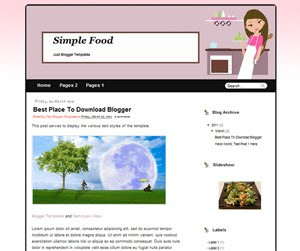 Descriptions Simple Food is special blogger templates for woman because Pink color very dominant on this blogger templates, two column and right sidebar is feature for this blogger templates. Minimalist design and compatible on all browser make this templates very fast.